From Pudding Green the scenery is less than inspiring but very quiet as you cross the Izon Turnover Bridge. 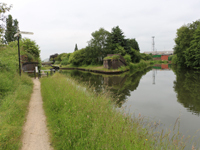 Built to serve local mines, the Wednesbury Old Canal was the first part of the Birmingham Canal to open in 1769 dramatically reducing the price of coal. Modern factories, partly hidden behind trees, now line the canal as you get to the junction with the Walsall Canal at the fairly desolate Ryders Green. In the absence of a bridge you clamber over the lock gate, there's no proper towpath and the grass is high, there's a strange smell in the air and the remains of several small bonfires. This foray is clearly for enthusiastic walkers and BCN completists as from here the canal is almost unnavigable, a silted up highly polluted dead end. The water is muddy brown and soon disappears under a jungle of reeds. The canal reappears near Swan Bridge only to give up the ghost a little further on. The towpath is clearly not well trodden and the surrounding landscape is made up of scapyards, high metal fences, barbed wire and industrial debris. The Black Country New Road brings a halt to proceedings as the canal disappears into a culvert at the Swan Roundabout. Cross over the traffic island and walk to the left of the Ridgacre pub and you can find a path and pick up the course of the old canal which ran for a further mile or so to Balls Hill. Go to the right of the pub and the Ridgacre branch, that opened in 1828 is still in water, although choked with reeds and shopping trollies. Fortunately the canal opens out after the metro bridge where a man feeds bread to the ducks, then throws the plastic wrapping into the canal as well. The towpath continues to be a pleasant stroll and soon you reach the attractive expanse of Black Lake favoured by anglers before finally calling a halt at Hateley Heath.